As a child, whenever I was asked, what do I want to be when I grow up – my answer was Interior Designer (Also singer at times, but well…). That childhood dream vocation soon vanished in thin air, but not my love for decking up spaces. I was addicted to the game SIMS, if you happen to know it. And my favorite part of the game was building homes. I would build my dream homes in the game and would be overjoyed by the outcomes. As a child, I did not have the privilege of having a room of my own until I was a teenager, that too to be shared with my younger brother. I want my kid, who is 2 now, to have his own space soon hopefully. And I would do it up in an amazing way (till he is old enough to make his own decisions or choices). If you are based out of Mumbai or Delhi, Asian Paints is now giving you a chance to make these dreams come true! Canopy bed has forever been on my wishlist. And love this wall colour! Want to know how? 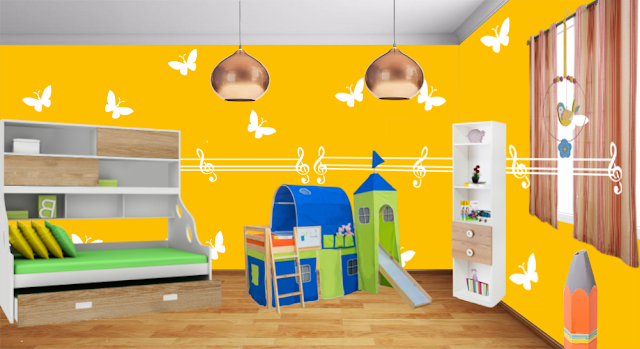 Log on to http://colourstore.asianpaints.com, sign up or log-in via Facebook/Google and create your room. Choose a bedroom or living room, go for the one that is closest to how your bedroom, kid’s room or living room is lay out so that you can get the most realistic outcome. 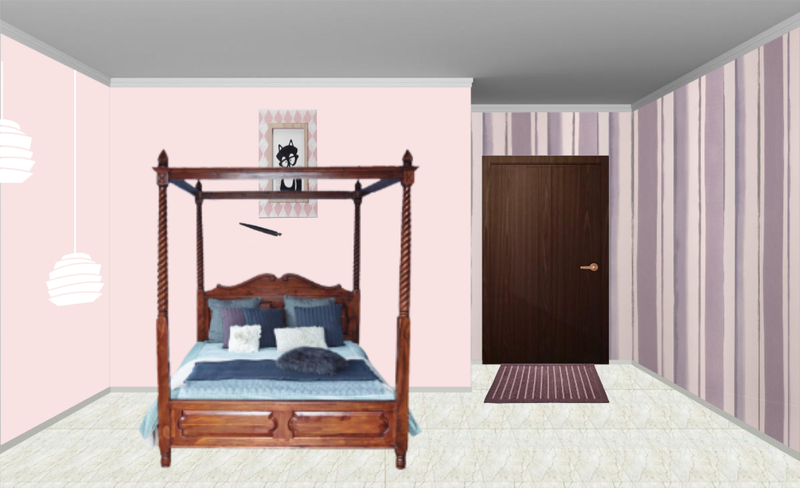 I decided to see how could I do up my bedroom, and also tried my hands on a kid’s room for my little one. Once you select the room, browse through the different elements ranging from wall textures, wallpapers, furnishings, lighting and the list goes on. Choose whatever you fancy, be creative, but I would suggest do not over-do it. You can flip or change the size, so do take a look at all the tools provided. That’s not it, every element you pick, the pricing is given. This is something I have seen for the very first time and was pretty impressed. So while you make your dream home on the portal, you even have a good idea of how much it will cost. I think my kid would be quite happy with this! The idea here was to avoid the clichéd pink for girl blue for boy, go for yellow which is a nice bright and happy colour that is also known for increasing concentration and creativity. I gave the walls some butterflies and music (keeping in mind that this would probably last for a good 6-8 years and my kiddo might outgrow childish cartoons). I love bunk beds and they’ve been like a dream for me, but that is an option if you have 2 kids. Since I have one, I selected this single bed with lots of storage to keep blankets, toys or whatever the need be. I added a matching shelf with drawers to keep clothes and more toys or other knick-knacks. Also since he is just a toddler now, a play-pen is most important (I would probably find him sleeping in it half the times). And some final touches with curtains, a hanging ornament, lights etc. One important thing I kept in mind was to have a lot of space otherwise so that kids can play around, and even when he has friends coming over there is enough space. What do you think of this look? If I have inspired you enough, go make your own style and submit your entry. Submit you entry link in the comment section and 2 awesome entries stand a chance to win a gift-voucher worth Rs.500 each! Plus, you never know, you might just end up making your style come true! Good luck! I would kill for this style! Love to be surrounded by blues and browns. Here's my entry: http://colourstore.asianpaints.com/gallery/rest/fetchprojectdetail/28539/-1984650041. Congratulations Jul on winning the contest! Apologies for the looong wait.